Sindhis presently living in Sindh are the original representatives of Sindh and its precious culture. They are making their livelihood on that soil, and are also practising the Sindhi customs and ceremonies. Sindhis in Sindh are the true custodians of Sindhi culture and values. Sindhis in Sindh speak in Sindhi, whereas if you see all around the world Sindhi language has almost vanished. Our children cannot read and write in Sindhi. Unfortunately they can't even talk in Sindhi. Keeping in mind our Sindhi culture, which is fading away with time, it is very important if we remain in touch with our roots which are in Sindh, our motherland. 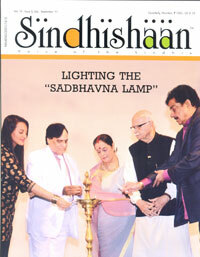 Your outstanding magazine has always encouraged Sindhiyat and by publishing an interview of a great Sindhi spiritual leader and Saint Hazuri Roop sai Sadhram sahib, the true successor of Saint Satramdas Sahib who was the beloved Guru of Amar Shaheed Bhagat Kanwarram Sahib, has added an additional beauty to SindhiShaan. Saint Sadhram Sahib in his interview has very beautifully explained the loving relationship of the Sindhi Hindus and Muslims, living happily with each other. He has also informed us of the treasure of Sindh in the form of its great Saints Poets and scholars, like Saint Satramdas Sahib, Amar Shaheed Saint Kanwarram Sahib, Sachal Sarmast, Shah Bhitai and many more which proves that the soil of Sindh is so precious. The overall interview with Saint Sadhram Sahib is also a wonderful source of information to our young generation through Sindhishaan. I suggest you to please add regular news updates from Sindh in your magazine and also try to publish more and more about the lives of people living there. Since our roots are based in Sindh, our motherland, It is ideal for our young generation to be wellversed with our rich Sindhi culture, and Sindhishaan can give this a strong platform.